As Croton’s first, and for many years, only preschool, CCNS has been welcoming, teaching, and loving children from Croton and surrounding towns for nearly seventy years. 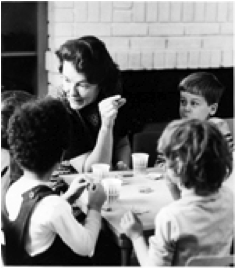 A group of parents in 1945 conceived of CCNS as a cooperative educational experience in which parents, teachers and children would reach within themselves and out to the community in order to give children a well-rounded sense of self and of their world and to inspire a lifelong love of learning. On September 12 of that year, CCNS ushered in its first class – 14 preschool children. Class was held in the old American Legion Hall on Terrace Place. Through the generosity of the late Samuel L. Rubin, CCNS acquired the property and house on 25 Van Wyck Street, where the school is presently located. CCNS parents raised funds to renovate the school and stock it with the necessary tools of learning. Today, parents give their time and talents to keep the school a bright, safe and secure place for their children. CCNS is structured so that parents are an integral part of their children’s first school experience, where parents connect with their children in the classroom and among their peers. They set a caring, enriching and productive example to their children by participating in the classroom, reaching out to the community, raising scholarship funds and taking part in family/school activities. To this day, CCNS opens its doors each fall to a new crop of faces, rededicating itself to planting seeds of growth. Every fall, former CCNS students enter kindergarten ready to embrace life and learning and to become proud and productive members of their communities. Look around, close to 2000 alumni of CCNS are out in the world, making us proud.